Recently, I did a post on the drugs and treatment that are most likely being used, and for the most part, flying below the radar. The latest movement out there is the idea that getting rid of race day medication will clean up the game, creating a positive public perception. As I outlined in my blog piece, race day medication (which is pretty much Lasix) is just the tip of the iceberg as far as performance enhancers go. And the jury is still out regarding whether cutting out Lasix would be more humane or less humane when looking at race horses collectively. The most logical argument I see against Lasix is the one that looks at average starts per year in the 60's and 70's versus average starts per year today. But lets not forget that they were testing for a lot less back then, and you could be sure that something was being used to prevent or curtail bleeding back then on known bleeders. Also one could argue that because of high Stake purses for 2 year olds and three year olds, and a need for quick returns by breeders, coupled with the fact that would be bleeders could now become Grade One Stake winners and then become highly sought in the breeding shed, that today's race horse is bred to be less durable than yesteryear's race horse. So what is banning Lasix going to accomplish? Well, if Bill Finley is correct on his assertions that Lasix masks a bunch of banned concoctions, then some "Super Trainers" will see a decrease in their win percentage. Horses will still break down, so forget about getting the PETA types to go away. As for gamblers, I maintain that drugs in horse racing is just another smokescreen excuse used by Horseplayers for why they are thinking about quitting. It really boils down to having their bankrolls last, and drug cheaters only add fuel to already high takeouts, for if someone is using the inside drug information when betting, they are causing even lower payoffs than what normal takeout rates create. In other words, getting rid of drugs might take away some of the backstretch edge, allowing for Horseplayers to last longer collectively, but it is highly unlikely that it will draw more players into the game. We need much lower track takeouts to accomplish that. We need visible long term winners in the game, so that newbies have a reason to buy a bunch of handicapping books or software. But what would getting rid of drugs do to horsemen and horses today? Chances are that the breed is weaker, and getting rid of drugs will cause less starts. We are already seeing a shortage of owners and horses today, and this shortfall is going to get worse as less horses are bred over the next few years because of the cost of owning a horse is too high, and much of that is because in order to compete to make money, owners have to spend quite a lot on vet bills. It is an ugly Catch 22 situation right now. As for the horsemen, I wonder if today's generation of trainer knows how to efficiently train a horse drug free in North America. There is no way they will be for a banning of drugs. Decisions need to be made on the basis of not only tomorrow but today. Banning of drugs now will most likely kill the game. I hate to say that, but it is reality. Banning of drugs and certain procedures have to be done methodically, and nothing is better than full transparency. The first thing to do is to get every jurisdiction on the same page. The game is broken right now, and it needs to go in a different direction. But all participants have to go in the same new direction. Second, make a list of legal substances and procedures. Lasix, go with it for now (maybe slowly cut the dosage). Tapping, allow it too. But document it. Maybe consider race day usage of Bute and Banomine to try to get everyone on an equal playing field for now while cutting down vet bills substantially, making the game more affordable for new owners. Oxygen treatments, again document it. Make it clear that any drugs or treatment not on the list are not permitted and that if used, the trainers will get the book thrown at them (preferably criminal charges too). There definitely needs to be a list of legal drugs and procedures and a huge deterrent not to use something else or the idea of banning anything becomes the same joke it is today. Now the tricky part. When I state that when a horse is tapped it should be documented, the same with oxygen chamber treatments, this information should appear in the past performances. We are now in the 21st Century. Things have changed. There is no longer 40,000 people filling a race track on a Saturday. There is no good reason for lack of transparency. From a bettor's standpoint, we have every right to know when a horse was tapped, gelded, had a throat operation, etc. Why should the owner, the trainer and some of the trainer's staff be the only ones to know this, and possibly profit on it at the windows? If this happened in the real world (ie the stock market), it is called insider trading and if caught, a jail sentence might happen. Yet bettors are complacent when it comes to this and some actually wager on the basis of seeing stable money on a horse. Why is this acceptable today? Put this stuff in the form. Again, by eliminating advantages the stable has, the regular Horseplayers will all last a little longer. This can only help the game. Horse racing cannot afford to lose even one more player. Horseplayers will love this stuff to begin with at least, as it will lead to additional statistics and angles. Most Horseplayers love angles, especially ones that are based on objective data. As for the claiming game. Well, it takes away a lot of the "poker" action some trainers like to play when dropping a horse. But so what? Inevitably, full disclosure will lead to more claiming and more owners as the new potential owner will have a lot more information on the potential purchase. At first, owners may shy away from horses that have too many procedures, but as time goes by, patterns will emerge, and trainers will still be able to play a little poker. Meanwhile, claiming owners will go into the game with a lot more confidence. Take a look at major league sports. Trades are now void most of the time if the new acquisition fails a physical. Why should horse racing be the complete opposite of this? Especially when the two biggest growth components are bettors and owners. I can't stress it enough, but deterrents are the key. There might be an inclination for some trainers to continue with shenanigans unless certain rules are in place. I think what makes sense is that vets have to report each procedure to the racing office (who reports it to Equibase), but the trainer too, has to report all procedures at the time of entry to the race office as well. Both the vet and the trainer will be subject to a huge fine and lengthy suspension if they don't comply 100%. The same thing would be true of anything that goes on outside of a racetrack, like hyperbaric oxygen treatments. The owner of the center has to report any horse that is treated, as well, the trainer has to report at the time of entry. If reporting doesn't occur by the center, they are subject to a fine and lose their ability to treat licensed race horses. This is how it should be, and this is how it has to be. Full transparency will eventually rule out the bad drugs and procedures and it will also pinpoint the permissible drugs and treatments over time. And it might not even take that much time at that. Regulators will soon see what combinations leads to more races, and more importantly, which might lead to a higher percentage of racetrack deaths and changes can be made very quickly and effectively to truly clean up the game. Don't get me wrong. I think it would be great if horses only raced on hay, water, and oats. But we are a good decade plus away from even considering that. Banning of drugs in the long term could be fantastic for the game, as many horses will not be able to compete at the higher levels. OK wait, this is where I'm going with this. The horses that can compete at higher levels are more likely to become household names, because there will be fewer of them. We might see more Triple Crown winners, for example. Besides winning Horseplayers, horse racing needs super stars to get the newbies and tire kickers to get involved. I don't pretend to speak for all price sensitive Horseplayers, but I might be (most are extremely intelligent like me), when I say that a 12% or 14% 50 Cent Pick 5 isn't enough to lure me to play tracks with exactor and double takeouts of 22.68% (Hello Hollywood) or triactor Pick 3, Pick 4 and superfecta takeouts of 27% (Hello Calder). I play Pick 5's sometimes, don't get me wrong, but they are probably the last thing on a betting menu I need when it comes to attracting me to a card or track. In other words, I could easily live without the Pick 5. I can't live without exactors, doubles, triactors, and Pick 3's. Until California rescinds their takeout hike in January,I don't think many of the boycotters will even think about Hollywood Park. As for Calder, personally, the only thing I know about that track is that it is in Florida and that it is a mile track, I think. I don't remember the last time I played Calder, and I have zero intention of doing any handicapping there until they drop takeout significantly on many of their wagers. Moves made by tracks like Hastings are applauded be Horseplayers like me. They dropped WPS takeout as well as Pick 4 takeout to 15%, while adding a Pick 5 with a 15% takeout. If all tracks went the same direction of Hastings, we would see handles increase everywhere eventually. It may take Hastings some time to gain momentum, but they took a large step in the right direction. Hollywood and Calder took baby steps, Hollywood after taking a gigantic step backwards. Bottom line, if tracks are serious about growing the game, and growing their customer base, they should be lowering the betting types with the lower churns, like WPS, exactors and doubles, not bets that Horseplayers cash once a month if they are extremely lucky. After the DRF did a sugar coated article on Santa Anita's recently concluded meet (I have too much decency to link it), Bloodhorse.com did an exceptional job on stating what exactly happened at Santa Anita. I expect the California Handle Massacre to continue until the takeout hike from January 1st is rescinded. Great marketing move by the Jugheads Inc. They have recently started an initiative of featuring a Pick 4 each night that has a guaranteed pool. They have also partnered up with TrackMaster for free past performances on these events. Almost enough to get my feet wet. I just need a couple more dollars that I consider burnable:) I never was any good when it came to handicapping chariot races. Some trainers may not really be into the hay, oats and water regimen when it comes to getting the best production out of a race horse. It is highly doubtful that high percentage trainers aren't at least toying with at least something. Back in the good old days (the 50's and 60's), when a thoroughbred race horse could run 20-35 times a year, performance enhancing drugs weren't discussed much. Were they out there? Yes. But were they used by many? Most likely not. Testing for drugs using saliva didn't begin until the 1934, and drugs like cocaine were allegedly used prior to that. Sir Barton allegedly raced on it (nicknamed "hop"). Mostly though, horse racing was tainted by rumors of trainers drugging heavy favorites not to run so fast, so that the insiders could cash a ticket on the second choice. But it seems trainers have always looked for an edge (check out the ads in Horse Trainer Magazine, there is a smorgasbord of legal products that claim to heal horses or make it possible for them to have peak performances). Using the Google timeline resource, you can see there are quite a few stories from the 60's about drug violations in horse racing. Coramine (a stimulant) seemed popular back then. In 1968, Bute (phenylbutazone) made headlines when Kentucky Derby winner Dancer's Image was DQed after he tested positive. Science has changed a lot since then, on the good side, making testing for illegal drugs more precise, but on the bad side, allowing for junior chemists to come up with non testable performance enhancing concoctions and methods, including concoctions that will mask illegal drugs. The RCI has come up with over 800 illegal substances. Masking some of these, or using some of these that may not be tested for in certain jurisdictions might just be the in thing to do these days, if you are a trainer who may want a higher win percentage. Among the equine stimulants are amphetamines, as well as the amphetamine-like drugs such as methylphenidate (Ritalin). Horses can also be medicated to win by relaxing them, and allowing the horse to run its best possible race. The widely used tranquilizer acepromazine, and any number of related or equivalent agents, have been used in this way. Of course, higher doses of tranquilizers can also decrease a horse's performance. Improving a horse's "wind" by opening its airways through the use of bronchodilators may also improve performance, especially in an animal that is sub-clinically broncho-constricted. Some bronchodilators can also have a stimulant effect. Veterinarians certify horses as being sound in "wind and limb." Obviously, medications that can affect these parameters and also the "attitude" or "behavior" of a horse have the potential to affect both the presentation of a horse and also, presumably, the outcome of a race. Many states have no laws regarding anabolic steroid use on horses, but there has been an aggressive change in attitude lately with New York and Kentucky leading the way to their banning. Why ban anabolic steroids? Because they artificially build up a horse's strength and because they have been known to have adverse long term affects, at least on humans. Using bicarbonates (milk shaking) on horse cleans up the lactic acids that are produced naturally in horses. Less lactic acids help the horses chances to run faster and longer. As an aside, I was talking to a harness trainer who told me that he complained about the turnaround a horse had to another trainer. He said that the trainer of that improved horse must be milk shaking, to which the other trainer replied "he bought my old bicarb machine, do you need one?" Many jurisdictions try to test for excess bicarbonates in the blood stream. There are probably still many ways around getting positives. Propantheline bromide relaxes muscles and increases blood flow. Benzoylecgonine is a bi-product of cocaine and results in a horse being less fatigued during a race. Darbepoetin-alfa which is a major ingredient in the prescription drug Aranesp® is becoming as notorious in Ontario as EPO (see below). The drug increases blood flow and reduces anemia. Long term side effects are thought to be similar to that of EPO as well. Erythropoietin is probably the most talked about illegal drug that is thought to be used in many jurisdictions including Ontario. EPO has a bad rap associated with it besides being an illegal enhancer, it allegedly can cause horrible long term side effects like an immune mediated anaemia and even death. What EPO does in a nutshell is increase the red blood supply which increases oxygen capacity within the horse's circulation. For more about the devastation EPO does to the horse read this. Etorphine (aka elephant juice) has analgesic tendencies that are 1000 times more powerful than morphine. This drug is used to immobilize elephants. For some reason analgesics even in small doses act as stimulants in animals like horses and cats. FYI from Wikipedia: "Veterinary-strength etorphine is fatal to humans; one drop on the skin can cause death within a few minutes." This drug is common in dentistry on humans for local anesthesia. In horse racing it used nefariously as a pain killer that also can constrict blood vessels which reduces bleeding. AKA Viagra, yes, Viagra. Viagra opens blood vessels which enriches muscles which is thought to enhance racing performance. In an article over 3 years ago, Andy Beyer mentioned the strong rumour that trainers were using cone snail venom in synthetic form as a pain killer on horses. It is used to deaden nerves and has been around at least since 1978 when Alydar allegedly was treated with it. Back in 2005 a vet admitted to injecting vodka 75 times at $15 a pop. The vet called this a "pre-race adjustment" on the bill. Using vodka might be more prevalent at tracks with low purses. I have to add Pig Juice (Nitrotrain) to the list. Ray Paulick wrote a piece about it recently. It is described as a potent, short acting oral anabolic steroid. Like many other treatments, shock wave therapy can promote faster healing, but it can numb a sore horse's pain. Many jurisdictions do not allow a horse to be shocked more than 5-7 days prior to a race, but this can be very difficult to enforce. And it can't be tested for. The 2011 Super Trainer's drug of choice (at least according to many rumors) allegedly is Myo-inositol-trispyrophosphate (NormOxys) aka ITPP. ITPP "makes the hemoglobin in blood release more of its oxygen, enhancing physical performance in a swift and powerful way." I've saved the best for last. I'm hearing more and more about Hyperbaric Chambers. Yes, these chambers do promote healing in horses, but there seems to be a lot of evidence that trainers are using these chambers to enhance performances of horses. It is legal, by the way, but should it be? Treatments cost between $200-$400. So don't expect trainers at Fonner Park to be using this method. Oxygen is essential to athletic endeavors of any sort because it facilitates the production of glycogen, one of the main sources of muscle energy. In a process called glycolysis, a glucose (sugar) molecule is broken into two pyruvic acid molecules. A pyruvic acid molecule enters the muscle cell, where it combines with oxygen to produce adenosine triphosphate (ATP), the source of muscle energy. When insufficient oxygen is present to create ATP, the pyruvic acid becomes lactic acid. This lactic acid naturally diffuses to the bloodstream, where it is carried away. However, during intense exercise, the lactic acid cannot be removed quickly enough, and it collects in the muscle cells, causing fatigue. Mild hyperbaric oxygen therapy provides greatly increased oxygen saturation throughout the body, allowing the body to get the oxygen it needs to create ATP for energy and flush out the lactic acid that causes muscle fatigue. The elevated oxygen levels help athletes increase performance and recover more quickly after a workout. In addition, increased oxygen delivery to the brain facilitates brain function and enhances an athlete's ability to make the split-second decisions that can make a difference in the outcome of the game. New clients in Canada are affording us the opportunity to prove the benefits and value of our hyperbaric oxygen therapy chambers to Thoroughbred and Standardbred owners and trainers. The treatments will be used on current in-training thoroughbred and standardbred horses to enhance post race recovery time. By speeding the healing of injury due to the wear and tear of racing (i.e. lung and microcirculation damage), the well being of the horses with allow them to race more frequently, at higher levels. The jury is out on how many days a treatment is good for, or if the treatment masks other drugs as well. One human study indicates that maximum power intake as well as maximum oxygen intake improved by 7%, 9 days after using oxygen therapy. I'm not sure how many lengths that is worth, but maybe just enough to re-break in the stretch and win at 7-5. NYRA recently put a ban on using hyperbaric chambers less than 7 days prior to a race. There is definite concern. Lets say this kind of treatment does enhance performance. Wouldn't that give someone working at the backstretch gates of a racetrack a pretty good edge. I'd like the info on which horse gets signed out for a while and comes back to race, or horses racing "off the farm." You know, "swimmers," etc. When horses are away from the track, it is a lot easier to inject cobra venom too. Hyperbaric chambers and cobra venom. That might account for some high trainer averages we see. Are racetracks doing their job and monitoring the sign outs and those horses who come in off the farm? Or are the insiders keeping it hush in order to try to cash a few more bets? The big question is should hyperbaric oxygen treatment be allowed period? A good discussion with a horse racing perspective can be found here. I'm with the guy who wrote that this treatment as well as "tapping" should be public knowledge. Put it in the racing form at least. The same day drug ban the RCI is looking to achieve within 5 years is only a small step in the right direction. Not even a baby step. More needs to done, and sooner not later. Horse racing isn't about to lower takeout collectively anytime soon. At least many astute Horseplayers have options. 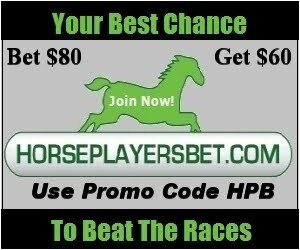 HORSEPLAYERSBET.COM offers Horseplayers industry high Player Reward Bonuses. No minimums. Earn rewards immediately. Wager at least $80 in total, win or lose, and you will get $40 deposited into your account. You will also start receiving the industry high Player Reward Bonuses daily as soon as you start wagering. To earn the $40 Bonus you must wager at least $80 in total within 7 days of making your initial deposit. Player Reward Bonuses could be the difference to you as to whether you win in the long run playing horses or lose. The better the rewards, the more of a chance you have to beat the game. Sure, you still need skill and luck as well to succeed, and at HORSEPLAYERSBET.COM at least you have a fighting chance. And one thing is for sure, your money will last longer because of the PLAYER REWARD BONUSES you receive. As handle continues to drop and as racing days are being reduced in many jurisdictions, the industry seems to be seeing less and less horse owners. It is becoming increasingly difficult to make money as an owner of a thoroughbred in North America. Much of the difficulty stems from a reliance on drugs which causes vet bills to be on the high side. Hay, oats and water trainers have a hard time to compete with trainers who give the horse the full medicine cabinet treatment. More owners, like Horseplayers, are leaving or cutting back, and very few new owners are starting up. The answer isn't to raise takeout, as California has found out. In fact, the answer is to reduce takeout so that more Horseplayers will be created, and to limit the amount of drugs and treatments a horse can have to compete. Back in the pre-Lasix days, some horses ran 30 times a year. But getting the industry on the same page to do what is right is worse than herding cats. I'm not optimistic. Prices haven't changed much, though some new "training" techniques like hyperbaric oxygen therapy have pushed up prices on some owners. And again, those willing to pay the high prices are playing at a huge advantage, but the end result is that this is helping to kill the industry as well. I'm going to make some assumptions here to give everyone an idea about costs: Your horse trains for 8 months in the year and races 12 times. For 4 months, your horse is resting at a farm. Also, your horse is Woodbine caliber and runs 11 times at Woodbine and once at Fort Erie. Training a race horse at Fort Erie could be a lot cheaper for an owner than training the horse at Woodbine. I'm going to go through the pluses and minuses. At Woodbine, trainers charge between $70 - $110 per day. The majority of trainers charge $75-85 a day. At Fort Erie, trainers charge between $40 - $60 per day. The majority of trainers charge $50 a day. At Fort Erie, some trainers will offer "the deal." The typical deal is where the owner buys the horse, and the trainer is responsible for all or most of the bills in return for half the purses, and half the equity in the horse once the owner gets his or her purchase price back. For a trainer, this deal is a killer for them unless the horse makes at least $30,000 for the year. Trainers who take deals on cheap horses are usually desperate, and you have to wonder about their foresight. The only way a deal makes sense for a trainer today is if the horse is competitive at a claiming price of $12,500 or greater. Remember, these are estimates. Trainers also bring capital investments to the table, some bring a lot more than others. That being said, they could save money by using a hot walker machine, for example, but it cost the trainer to buy the machine. Some have pulsating blankets too. The trainer can also save on feed by buying it off the track in bulk, but they could also add supplements, which may or may not appear on your bill as well as over the counter meds. Trainers also incur Workers Comp charges. 8 months of training and 12 races will mean about 8 pairs of shoes. At Fort Erie, the usual cost is $100-$125 a change. At Woodbine it is around $120-$150. If stabled at Woodbine, shipping once to Fort Erie from Woodbine would cost $200 for the year. If stabled at Fort Erie, shipping eleven times to Woodbine from Fort Erie would cost $2200 for the year. Shipping to and from your layoff farm total around $200 a year no matter if you have a Woodbine or Fort Erie trainer. Most farms charge between $15-$30 per day. So lets say the typical owner pays around $600 X 4 months per year. Many trainers will charge an additional 1% for a wins (and sometimes places and shows) on a training bill so that at least the groom will get a stake. Sometimes, trainers pay $50-$150 for a second as well to the groom (the owner is usually charged). So a typical owner of a Woodbine horse with a 12 starts a year (lets say 2 wins and a second), will pay an additional $700 in stakes. Stake money differs dramatically from barn to barn. Expect to pay around $200-$300 per start per horse on average regardless of the track. Some trainers will add on tack charges or over-the-counter meds onto your bill. Many don't charge for this. Some trainers will say that Fort Erie is a much more calming track, especially for a high strung horse. Lots of grass to graze on, and no airplanes coming and going every 2 minutes. But if you are at Woodbine, you have the option to train on the Poly, sort of a home field advantage. The other advantage to Fort Erie is that there is plenty of extra stall space. The management of Fort understands that in order for their training base to make a decent living, Woodbine horses are pretty much needed. This means your horse needs to make around $32,250 a year just to break even, because the trainer and jockey get close to 10% of total purses made. This means your horse needs to make $27000 a year to break even. If you own a horse that only runs at Fort Erie, the horse may have a few more layoff days because the season is a little shorter, and of course, less shipping charges, so the total that needs to be earned to break even may be $3,000-$4,000 lower than the amount of $26,700. Many Fort Erie trainers are just as talented as Woodbine trainers, but they may just like the small track/small town feel. Either way, the owner needs to have a trainer they can trust, and one who doesn't intimidate them. If the owner wants to have a big say, they should have it. It is their horse, and they are the one who is most at risk. Remember, if you are the owner, you are doing the trainer a favour by choosing to do business with him or her. Don't forget it.